I have to admit, I’m not an equal opportunity flour employer. I reach for wheat without a thought, except for perhaps whether I want to use high gluten, all purpose, whole wheat, or pastry flour. A few days ago, however, I got a really fun package from Celine of Have Cake, Will Travel (one of my favorite food blogs, by the way). She generously gave me a bunch of fun flours/startches from Bob’s Red Mill, and included was a bag of light spelt. 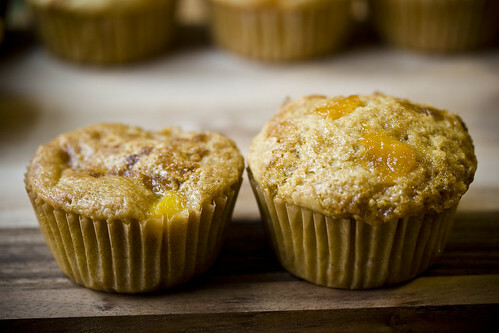 Line your muffin tins with muffin cups. Mix the dry ingredients together. 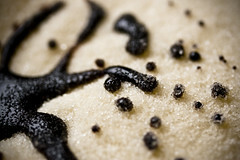 *If needed, you can make your own brown sugar by adding 1/2 – 1 tsp of molasses to 1/2 cup of sugar and mixing well. It takes a little while to mix completely, but you can make it as light or as dark as you wish. It’s my understanding that commercial brown sugar is made by mixing molasses back in to processed sugar, so it’s really not any different than store-bought. Whisk the wet ingredients together until incorporated and thickened. Add wet to dry and gently fold the until the flour is moistened and there are no dry spots. Add the chopped peaches and fold in gently. Fill muffin cups 3/4 of the way. 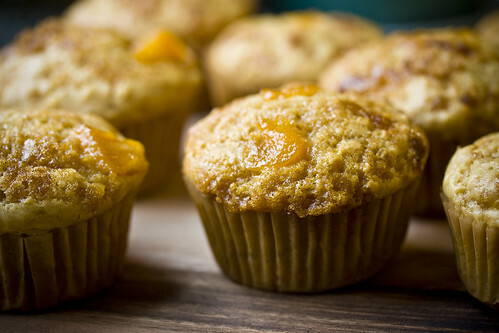 Sprinkle with extra brown sugar, and add extra peach pieces on top if desired. Bake for 18-22 minutes, or until lightly browned and a toothpick comes out clean. The centers should also bounce back when pressed lightly. First off, let’s get appearances out of the way. 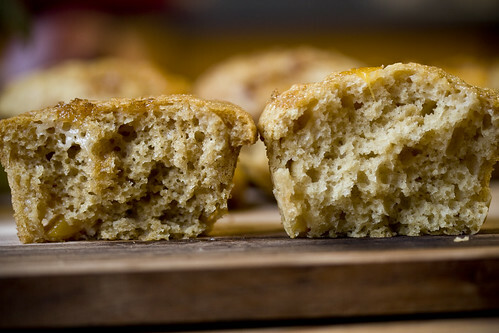 In general, the spelt muffins were darker, flatter, and more moist than the wheat muffins. I think the rising issue can be resolved, or at least improved. The spelt batter was a lot wetter than the wheat batter. It’s possible I accidently added too much liquid, but it seemed that the wheat was more absorbent than the spelt. I think the wetter batter contributed to the spelt muffins not rising as much as the wheat. More on that in a second. If I were truly dedicated I would have made a third, dryer spelt batch to test my theory, but two dozen muffins is plenty for my husband and me. If I made three dozen we’d still eat them all, which is why it’s really important for me not to make them. Next time, I’ll shoot for a light and airy batter that’s just barely thick enough to hold air bubbles, instead of a drippy, pancake-like batter. If I saw these two muffins sitting out, I’d grab a wheat muffin. They just look better, don’t they? But after tasting both muffins, I have to say that the spelt muffins weren’t just good, they were superior. I went into this test fairly prejudiced. I was expecting to report to you all that the spelt tasted “fine, but wheat is definitely better.” Several back-to-back bites confirmed my initial decision. The spelt is definitely better. 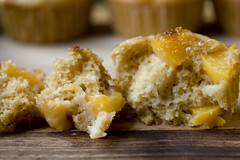 The spelt muffins taste richer, almost buttery. 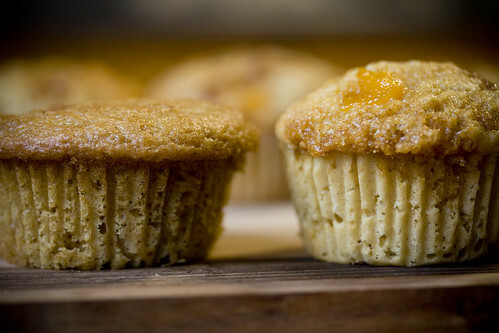 The wheat muffins taste good on their own, but when compared directly with the spelt, their flavor is flat and sponge-like. I was really expecting the spelt to taste “off” – not bad, but different enough to make my wheat-tuned palate complain. I’ll have to use spelt in some other recipes to confirm, but in this recipe it’s the clear winner when it come to taste. But back to the less-than-spectacular appearance of the spelt muffins. The crumb of the spelt was definitely more delicate than the wheat – the muffins fall apart with only the slightest coaxing. The gluten present in spelt is more delicate than in regular wheat; overmixing, undermixing, too much or too little liquid–all these can cause a less-than-spectacular finished product. 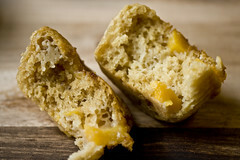 If you hit the sweet spot, the gluten develops enough to hold in gasses that provide a beautifully risen product. Too much mixing (or kneading if you’re making bread) can break the gluten, not enough prevents it from forming at all. With these muffins, I think the batter was so wet that it became too heavy for the delicate nature of spelt, preventing prettily puffed muffins. I’m surprised that I actually prefer the taste of spelt over regular wheat. You should try it, you might too! Also, I could be crazy, but it smells a little like popcorn when it’s baking. Fun! Special thanks to Celine for broadening my grain horizons. I have baked bread many times using whole spelt flour. I find it to be not as forgiving as whole wheat or unbleached all purpose. You are quite right to say the lower gluten content makes it a more delicate batter, or in the case of bread, dough. I have found that if the kneading or the temperature in the oven is not just right there will be imperfections. The most common problem I run into is separation of the upper part of the crust from the loaf leaving an air space beneath the top of the loaf. I wonder if you, or anyone who frequents this site may have some ideas how to deal with spelt flour when making bread. Oh my gosh! I made these today with just ordinary white flour an they were DELICIOUS. So wholesome and the perfect balance of sweetness. Definitely making them again. Probably tomorrow! Haha! bless this post with love,peace,respect and success. CAn you use light rye flour? 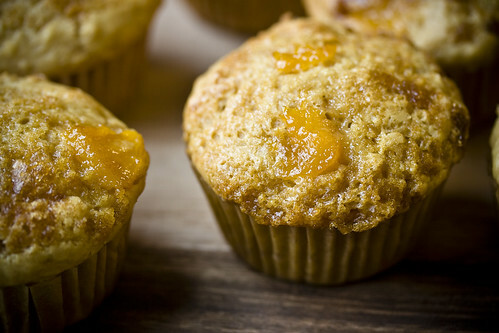 I made these today with canned apricots, all purpose wheat flower and silk soy milk. They are so good! i’m having a hard time keeping them around long enough for dinner. they are moist and not too sweet. very good recipe.